Brown meat and drain well, if necessary. While meat is cooking, stir together eggs, ricotta, grated Parmesan and salt and pepper. Mix cooked meat, macaroni, sauce and veggies. Add ricotta mixture and blend well. 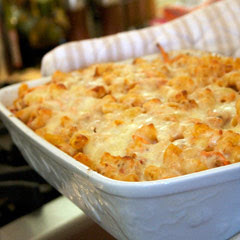 Coat a 9-by-13 baking pan with cooking spray or olive oil and spread half of macaroni mixture evenly over the bottom. Top with a cup of mozzarella and a healthy sprinkle of grated Parmesan. Add the remaining macaroni mixture and top with another cup of mozzarella and another sprinkle of Parmesan. Cover with foil. Heat your oven to 350 degrees F and bake the casserole for 20 minutes. Uncover and bake for another 10 to 20 minutes until the cheese on top is lightly browned and bubbly.